At the End of the Working Day, this Norman Rockwell painting, appeared on the cover of The Literary Digest published November 6, 1920. This illustration was Rockwell's nineteenth picture featured on the cover of The Literary Digest. 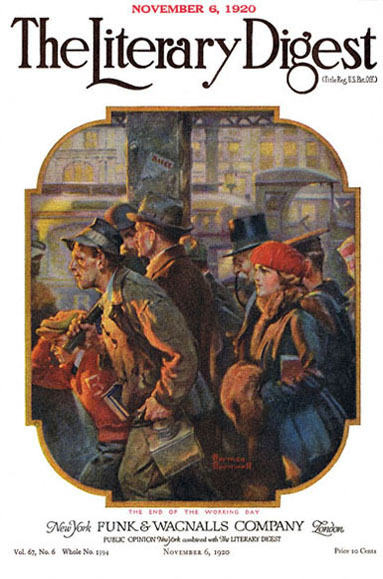 The Digest featured Rockwell artwork on the cover nine times total in 1920 alone. This painting also appears on page 53 of Norman Rockwell, A Definitive Catalogue by Laurie Norton Moffatt. This painting shows us the typical commuter rush at the end of the working day. At the End of the Working Day was only one of 47 Norman Rockwell Literary Digest covers; here is the list of more Norman Rockwell Literary Digest scans. Everyone is trying to get home as quickly as possible. Yet they seem considerate of their fellow commuters. No pushing. No shoving. Just making their way home. The glow of the sunset off of the left side of the canvas illuminates their faces. The commuters get to enjoy the sunset and the warmth of the sun on their way home this winter day. Norman Rockwell presents a variety of people in this painting. A schoolboy hurries along with books tucked under his arm. A workman carrying what looks like a huge hammer walks alongside the boy. A fine young lady with fur trimmed coat and fur muff strolls along also carrying a book under her arm. A gentleman in top hat hustles home. A sailor and several businessmen round out Rockwell's crowd of commuters.